Could Ezio finally be making his way to Nintendo Switch? A collection of Assassin’s Creed titles might be heading to Nintendo Switch if recent online listings are anything to go by. Multiple online retailers have listed the Ubisoft compilation with varying release dates. Many Assassin’s Creed fans may have felt a bit let down Odyssey (Cloud Version) was announced exclusively for Japanese Switch users, however, it looks like everyone’s favourite assassin franchise might be coming Switch in another form. European retailers Saturn and MediaMarkt have seemingly listed the Nintendo Switch compilation somewhat early. Both product pages share the same EAN (European Article Number) number of 3307216102021 and also list Ubisoft as the game’s manufacturer. 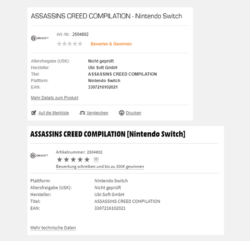 However, it’s the product placeholder title that is the most interesting, with both sites stating minor variations of “ASSASSINS CREED COMPILATION – Nintendo Switch”. While online retailer listings aren’t the most reliable source of information, the new Assassin’s Creed product pages will certainly raise a few eyebrows. Ubisoft hasn’t been shy about supporting Nintendo in the past and working on “Mario + Rabbids Kingdom Battle” should have helped strengthen that relationship. We’ve already seen Assassin’s Creed III / Black Flag on the Wii U and Odyssey on Nintendo Switch, so it’s not overly surprising that Ubisoft may want to bring more AC titles to Nintendo’s latest platform. If these listing do turn out to be accurate, it will certainly be interesting to see which of the franchise’s games are included in the compilation. 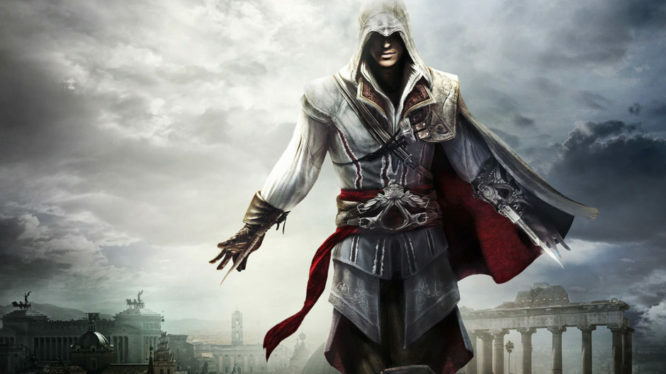 Considering the capabilities of the Switch it would seem more likely that a port of the 2016 Ezio Collection may be in the works, rather than later Assassin’s Creed titles. However, the same compilations have also been listed to PS4 and Xbox One, platforms which have both already seen Ezio Collection releases (thanks @HerrNintendo). Until we hear an official announcement or receive concrete evidence, we won’t know for sure exactly what these listings mean. So grab a pinch of salt and keep your eyes peeled in the meantime. Ironically, this potential release has been anything but stealthy. New details about the Assassin's Creed Collection may have surfaced. The latest Assassin's Creed title is coming to Switch at launch in Japan.